I loved the unique and joyful people who came on the trip. I especially loved playing and snorkeling with the dolphins and learning about their different personalities. Playing chase and catch with Polly, a two-year-old dolphin, was one of my more exhilarating experiences. . . I really enjoyed taking the taxi boat back and forth between the islands. . . it was an unbelievable trip! I still can't believe we had the dolphins tow us through the water. The snorkeling was also wonderful, and I loved sitting on my deck over the water. On Saturday morning many of the younger dolphins were being very playful, bringing gifts of sea grass. 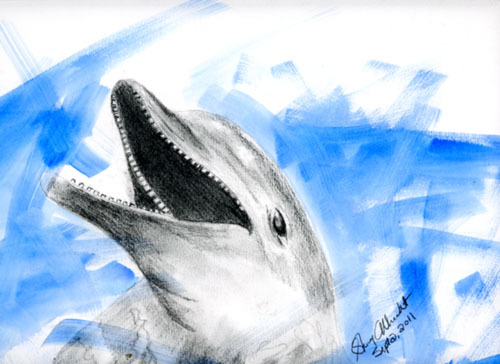 . . it is beyond amazing to receive a "gift" from a dolphin!